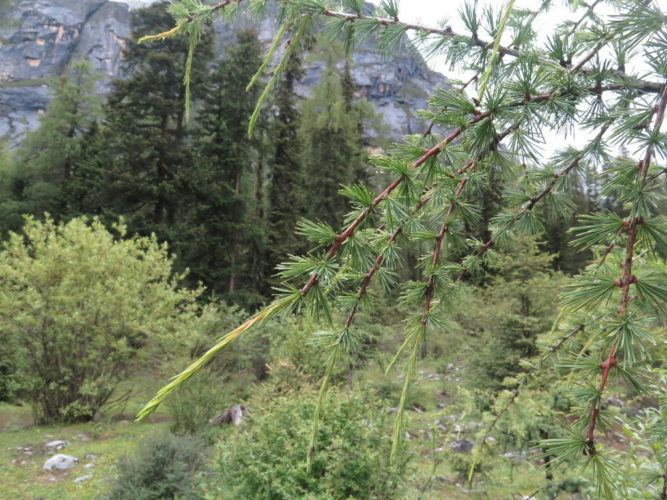 Larix mastersiana, first described in 1914 by Rehder et E.H. Wilson in Charles Sprague Sargent (1841–1927), is commonly known as Masters larch, as well as 四川红杉 (Sichuan hongshan) in the Chinese language. The species is named in honor of Maxwell T. Masters (1833 - 1907), a British botanist who did extensive morphological and taxonomic work with conifers, including naming several Chinese and Japanese species, as well as combining the names of others into the forms we use today. Description. Masters larch is a deciduous coniferous species of tree that grows to heights of 80 feet (25 m) tall with a trunk 32 inches (80 cm) in diameter, measured at breast height. Bark is fissured, gray-brown or dark brown in color. Branchlets are pendulous Long shoots are puberulent in texture, yellow-brown in color, graying with age. Short shoots are 0.12 to 0.16 inch (3 - 4 mm) in diameter, brownish yellow in color and densely pubescent. Leaves linear in nature, 0.48 to 1.14 inches (12 - 35 mm) long and 0.04 inch (1 mm) thick and keeled on both sides. Seed cones are brownish purple when young, maturing brown, cylindric-ellipsoid in shape, 1 to 1.6 inches (2.5 - 4 cm) long and 0.6 to 0.8 inch (1.5 - 2 cm). Seed scales are obovate-reniform in shape, 0.32 to 0.44 inch (8 - 11 mm) long and 0.4 to 0.52 inch (10 - 13 mm) with a densely pubescent lower surface and an emarginate apex . Bracts are exserted, dark brown-purple in color, broadly lanceolate, reflexed in shape and are 0.44 to 0.6 inch (11 - 15 mm) long. Seeds are light gray in color, obliquely obovoid in shape, 0.28 to 0.36 inch (7 - 9 mm) long including wing. Pollination takes place from April to May; seed maturity in October. Distribution. This species is native to China, on the western edge of the Sichuan basin of Sichuan province, growing at elevations of 8,000 to 11,200 feet (2,500 - 3,500 m) above sea level, where it grows in mixed coniferous forests along stream sides in the mountains. It is hardy to USDA Zone 7, cold hardiness limit between 0º and 10ºF (-17.7° and -12.2°C).